Although May 6, 1998, is generally considered the beginning of the 1998-2000 Eritrea-Ethiopia War, a border-related conflicted started earlier. Unreported incidents went as far back as 1992. In 1993, Tigray Administrative Region initiated “Border Rectification Project” to redraw unilaterally its border with Eritrea. Eritrean farmers were forcibly removed from their land. Crops and livestock were confiscated. Several attempts were made to resolve the problem between 1993-1996 without much progress. The problem deteriorated beginning in 1997. What follows is a partial timeline of the dispute that started initially as a border dispute, but later expanded into a much wider war. April 20-21, 1997: A meeting to discuss border issues that had surfaced in the course of the previous year was held in Shire, Tigray, Ethiopia between the Vice President of the Tigray Region of Ethiopia, and the Deputy Governor of the Gash-Barka Region of Eritrea. June 22-27, 1997: A sub-committee designated in accordance with the Shire decisions met to make a tour of the “demarcations,” a length it determined at about 40 kms. It was established then that at least three demarcations, each creeping into Eritrea had been laid on the ground. June 1997: Tigrayan authorities ordered that no Eritrean farmer was to plough fields or build houses or sheds beyond the “unilaterally demarcated” line and that the inhabitants of Eritrean villages were to be evacuated. July 18-19, 1997: Three truckloads of Ethiopian troops entered the Badme area and planted radio communications equipment. Eritrean territory inside the “unilaterally demarcated” area was, thus, put under patrol. Subsequently, massive expulsion of Eritreans begun. July 19, 1997: Two battalions of the Ethiopian Army came to Adi Murug and their commander met with representatives of the Eritrean Army in the area. The Ethiopians explained that they were there to chase armed Ethiopian opposition groups that they believed to be in the Badda area, and requested entry. The battalions were let in on this understanding. July 24, 1997: Ethiopian administrators instructed the Eritrean administrators to disband – they were taking over. They declared Adi Murug Ethiopian territory and appointed their own administrative committee. August 8, 1997: Two Eritrean officials traveled to Addis Ababa to discuss Adi Murug and Badme with their counterparts in Ethiopia. August 16, 1997: Less than a month after the Adi Murug and Badme incidents of July 19, President Isaias Afewerki of Eritrea wrote a letter to his counterpart Prime Minister Meles Zenawi of Ethiopia formally protesting Ethiopia’s actions. He called on the Prime Minister to take all necessary measures to put a stop to Ethiopia’s border incursions. August 25, 1997: President Isaias Afewerki wrote another letter to Prime Minister Meles Zenawi of Ethiopia. This time suggesting that a joint border commission be set-up – the Eritrean side to be led by General Sebhat Efrem, Minister of Defense. The first meeting for this commission was scheduled for November 1997. October 17, 1997: Weyin, the official organ of the TPLF, printed a new map of Tigray Region, which for the first time in almost a hundred years, altered Eritrea’s colonial borders with Ethiopia. The Ethiopian Mapping authority also officially printed this “illegal” map of the Tigray Region. Here, the straight line linking the Setit (Tekezze) River to the Mereb River at its confluence with the Mai Anbessa had disappeared and was replaced by an oblique line entering deep into Eritrean territory. November 1997: A joint High Commission on Demarcation met in Asmara and agreed to meet again within three months. There was no discussion on substantive matters. January 1998: Ethiopia tried by military means to occupy sovereign Eritrean territory on the Bure area (Assab-Dessie road). Unfortunately, Eritrean efforts to solve the problem amicably and bilaterally failed as the Government of Ethiopia continued to bring under its occupation the Eritrean territories that it had incorporated into its map. May 6, 1998: Ethiopian troops fired at an Eritrean patrol unit on routine duty along the border around Badme. It triggered a chain of reaction on both sides and several people were killed. May 13, 1998: The Ethiopian Parliament declared war on Eritrea. May 14, 1998: The Eritrean Government called for peace and invited neutral parties to examine the circumstances leading to the incident on May 6. May 14, 1998: The Cabinet of Ministers of the Government of Eritrea proposed a five-point peace plan. The Government of Eritrea condemns the logic of force as it firmly knows and upholds that border disputes of any kind can only be resolved through peaceful and legal means, and not through military means. On the basis of this principle, each party shall publicly announce to the peoples of Eritrea, Ethiopia and the international community the territories that it claims – if any – and designate them on the political map with clear geographical coordinates. Each party shall also accept that the dispute can not, and should not, be resolved by force, but through peaceful negotiations. Both parties shall agree that all negotiations and understandings shall be carried out in the presence and through the mediation of a Third Party. The latter will act as a witness and guarantor. Areas under “dispute” shall be demilitarized temporarily and be free from the presence of armies of both countries. The enforcement of this understanding shall be guaranteed by the Third Party. If the above proposal for resolving the dispute through the involvement of a Third Party and without complications is not acceptable, the matter is to be referred to an international adjudication. May 15, 1998: The Government of Eritrea expressed its readiness to accept an independent inspection by any third party to verify the facts of the matter on the ground. May 30-31, 1998: US-Rwanda Peace Plan presented to Eritrea and Ethiopia. The Governments of the United States and Rwanda, in an attempt to facilitate a peaceful resolution of the border dispute between Eritrea and Ethiopia, presented both parties a four-point peace plan. June 1, 1998: While the US-Rwanda Peace Plan was under discussion, Ethiopia launched an attack on Eritrea along the Ambesete-Gleba area. June 4-5, 1998: Ethiopia, while announcing acceptance of the US-Rwanda Peace Plan went ahead and bombed the Eritrean capital, Asmara. Ethiopian Prime Minister Meles Zenawi, while announcing his government’s “acceptance” of the US-Rwanda plan, ordered his troops to attack Eritrea. June 5, 1998: (morning): The Eritrean Government issued the following statement: “The four-point recommendations that have evolved in the facilitation process address the paramount issues that the Government of Eritrea has been raising and are, therefore, not controversial at all to the Government of Eritrea. At the same time, the Government of Eritrea believes that the facilitation process has not been consummated and that there are still serious issues of detail and implementation that need to be worked out in the period ahead.” Eritrean Ministry of Foreign Affairs, June 5, 1998. June 5, 1998: At 14:00 and 14:30 hours, local time, Ethiopian fighter planes launched an air strike on Asmara. They hit Asmara International Airport, killing and wounding 30 people, and damaging a Zambian cargo plane parked on the runway. About an hour later, an Eritrean plane retaliated by hitting military targets in Makelle, Ethiopia – destroying several Ethiopian fighter planes. Inadvertently, it also hit an elementary school near the airport killing and wounding 47 people. The Eritrean Government apologized for the incident. June 6, 1998: At 09:40 hours local time, two Ethiopian fighter planes bombed the southern outskirts of Asmara; because of Ethiopia’s imposition of indiscriminate bombing of civilian targets, most foreigners living in Asmara were evacuated. An Ethiopian fighter jet (a MiG 23) was shot down by Eritrea’s Air Defense Units. Ethiopia further imposed an air blockade and maritime access blockade to Eritrean ports through the threat of incessant and indiscriminate air bombing. June 10, 1998: In violation of the agreement between Eritrea and Ethiopia that citizens of each country do not need visas to visit the other country, Ethiopia instructed all carriers not to board Eritreans who do not have a valid visa to Ethiopia. June 11, 1998: Eritrea called on the International Civil Aviation Organization (ICAO) and the International Maritime Organization (IMO) to take urgent measures to ensure the safety of international air and maritime navigation in the area. June 12, 1998: Eritrean Air Force pilots bombed military targets in Adi Grat. June 13, 1998: The Government of Ethiopia ordered the deportation of thousands of Eritreans and Ethiopians of Eritrean origin from the country; it also fired thousands of others from their jobs. June 14, 1998: The Governments of Eritrea and Ethiopia accepted the proposal put forward by the United States Government on a total ban of air strikes by both sides. June 17, 1998: Ethiopia begins large-scale deportations. About 800 Eritrean residents of Ethiopia arrived at the Eritrean border town of Um Hajer in the southwestern tip of the country. June 25, 1998: The Government of Ethiopia ordered the families of the deported to mortgage their businesses and property and leave the country within one month. By this time, the number of deportees was about 1150, most of them were prominent businessmen and professionals. June 10, 1998: OAU calls for a peaceful resolution to the conflict. The Organization of African Unity (OAU) at its 34th Summit in Ouagadougou, Burkina Faso, called for a peaceful solution to the Eritrea-Ethiopia conflict. July 1, 1998: UN High Commissioner for Human Rights (UNHCHR) Mrs. Mary Robinson expressed her serious concern over Ethiopian expulsions of Eritreans and Ethiopians of Eritrean origin from Ethiopia. July 1, 1998: Ambassadors from Burkina Faso, Djibouti, Rwanda and Zambia held talks with Eritrean officials as part of an initiative by the OAU, following the failed US-Rwanda Plan. July 11, 1998: Following Meles’ speech that Ethiopia can deport even for not liking someone’s color of eyes, by Ethiopian admission, more than 2400 Eritreans were rounded up, 1000 in Addis Ababa alone. They were deported the next day. Aug 1-2, 1998: The Organization of African Unity Ministerial Committee met for two days of talks in Ouagadougou, Burkina Faso. Its main aim was to resolve the border dispute between Eritrea and Ethiopia. August 6, 1998: The US Department of State issued a statement condemning the detention and expulsion of Eritreans from Ethiopia and called on the Ethiopian Government to respect international human rights norms and standards. August 6-12, 1998: About three thousand Eritreans expelled from Ethiopia arrive in Eritrea. Some of them came through the border town of Zalambessa. The number of Eritrean deportees from Ethiopia reaches over 16,000. August 13, 1998: Ethiopia gave Eritreans working for international organizations and embassies in Addis Ababa one month to leave the country. The Ethiopian government also admitted that it had served notice to some 87 Eritreans and Ethiopians of Eritrean origin working in embassies, international organizations and non-governmental organizations to leave the country. September 16, 1998: The US Government communicated to Eritrea its desire to launch a new initiative. This new initiative was to be led by Mr. Anthony Lake, the former National Security Advisor (1993-1997) under President Bill Clinton. Mr. Anthony Lake becomes President Clinton’s Special Envoy to Eritrea and Ethiopia. October 6, 1998: U.S. Special Envoy Anthony Lake arrives in Eritrea to make a second attempt at finding a peaceful solution to the five-month border conflict between Eritrea and Ethiopia. The first attempt was the US-Rwanda plan drafted by President Clinton’s Assistant Secretary for African Affairs, Susan Rice. The US-Rwanda plan was terminated on June 4, 1998. October 29, 1998: Ethiopia shelled southwestern Eritrea (Badme area). Several villages were destroyed, more than a hundred crop fields burned, and a farmer and a child instantly killed. On the same day in the Senafe area, barrages of Ethiopian shelling similarly destroyed villages, burned crop fields and killed three peasants. November 7-8, 1998: The Ethiopia-Eritrea Peace Summit was held in Ouagadougou, Burkina Faso. At this time the OAU presented a Framework of Agreement that had 11-points. The OAU document was identical to the US-Rwanda plan. Except that the latter four points instead of eleven. November 11, 1998: Ethiopia formally announced that it had “accepted” the OAU proposal. November 19, 1998: The UN Security Council passes a resolution unanimously urging nations to restrict arms sales to African countries embroiled in a conflict. December 6, 1998: U.S. Special Envoy Anthony Lake arrives in Asmara – his third visit to Eritrea. December 12, 1998: Eritrea submitted a list of questions on the OAU’s Framework for Agreement seeking clarifications. December 17, 1998: Three people were killed and at least 24 wounded when Ethiopia shelled the Eritrean town of Tsorona. December 17, 1998: The OAU’s Central Organ for Conflict Prevention, Management and Resolution began its meeting Ouagadougou. About 20 Heads of State and Government attended the meeting. The meeting endorsed the High-Level Delegation’s 11-point proposal for solving the Eritrea-Ethiopia conflict. December 18, 1998: Ethiopia formally announced that it has accepted the Proposal for a Framework Agreement as endorsed by the Central Organ of the Organization of African Unity (OAU) in Ouagadougou. January 3, 1999: One thousand three hundred sixty seven (1367) Eritreans and Ethiopians of Eritrean origin expelled from various towns in Ethiopia arrive in Assab. By this date, over 47,000 Eritreans had been deported from Ethiopia. January 18, 1999: Anthony Lake, President Bill Clinton’s former National Security Advisor, once again shuttled between Addis Ababa and Asmara and held a fourth round of talks with Eritrean officials. His first round was in October 1998. January 26, 1999: The OAU gave a reply to the 26 questions Eritrea raised on the framework agreement on December 12, 1998. The OAU took forty five (45) days to reply. January 29, 1999: The UN Security Council voted unanimously to support efforts made by the OAU to end the border war between Eritrea and Ethiopia. January 29, 1999: Amnesty International released a document on Ethiopia’s gross human rights violations of Eritreans and Ethiopians of Eritrean origin. February 5, 1999: The Ethiopian government alleged Eritrean fighter planes bombed the town of Adigrat, Ethiopia. The allegation was proved to be false by independent journalists and foreign governments. February 6, 1999: Ethiopia breaks the US-brokered air moratorium and bombs Eritrean towns and villages. Ethiopia launched a massive offensive on the Badme Front on February 6, 1999 and February 8, 1999 on the Tsorena Front. February 6, 1999: The Ethiopian Government launched a large-scale attack against Eritrea on the Mereb-Setit Front. February 7, 1999: The Ethiopian Government shelled the town of Adi Quala killing eight and wounding 23 civilians. February 9, 1999: The Ethiopian Government declared Eritrea’s Ambassador to Ethiopia, Girma Asmerom, “persona non grata” and asked him to leave Ethiopia immediately. February 10, 1999: The UN Security Council passed a US-drafted resolution that demanded an immediate halt to the fighting and strongly urged all states to end immediately all sales of arms and munitions to Ethiopia and Eritrea. February 12, 1999: Ethiopian authorities ordered troops who had surrounded the Eritrean Ambassador’s residence in Addis Ababa to break into his residence. Their actions violated Article 22 of the Vienna Convention which guarantees the inviolability and immunity of premises and property of diplomats and diplomatic missions. February 14-15, 1999: Ethiopia started an offensive along the Burie Front. Eritrean defense forces shot down one MI-24 helicopter gunship. February 16, 1999: Three Ethiopian fighter planes dropped bombs on a water reservoir near Assab. February 17, 1999: Ethiopia attempted for the third time to attack water reservoir that it missed twice. This time its Antonov planes dropped six bombs in the area of the reservoir. February 17, 1999: The OAU High-Level Delegation urged both Eritrea and Ethiopia to put an immediate end to the fighting and to re-commit themselves to a peaceful resolution of the dispute based on the OAU proposals for a framework agreement. February 21, 1999: Ethiopia’s Antonov bombers targeted the airstrip in Assab dropping 12 bombs. All of the bombs missed their target. On the same day, Ethiopian Antonovs bombed the village of Mai Aini near Tsorena. They destroyed homes and property in the village killing four (4) civilians and leaving several others wounded. February 22, 1999: The U.S. Department of State released a statement of regret of use of air strikes by Ethiopia. February 23, 1999: Ethiopia launched yet another offensive on the Mereb-Setit (Badme) Front. February 24, 1999: Intense fighting continued on the Mereb-Setit Front. Ethiopian forces backed by heavy artillery, mechanized units and aircraft attempted, for a second day, to dislodge Eritrean forces from their positions. February 26, 1999: Eritrea announced to the world that Ethiopia had broken through its defense lines at one point on the Badme Front. Since this made Eritrea’s fixed defense lines vulnerable Eritrean armed forces withdrew and re-established a new frontline. February 27, 1999: Eritrea informed the UN Security Council that it has accepted the OAU peace plan and was ready to implement it. The plan was submitted on November 8. The UN Security Council welcomed Eritrea’s decision to accept the OAU peace plan previously agreed to by Ethiopia. February 28, 1999: Ethiopia launched a fresh offensive in the Badme area. July 14, 1999: Eritrea accepted the Modalities for the Implementation of the OAU Framework Agreement that was endorsed and tabled by the 35th Regular Session of the OAU Heads of States and Governments in Algiers. July 21, 1999: Ethiopia accepts the Modalities for the Implementation of the OAU Framework Agreement. August 5-6, 1999: The OAU presented the Technical Arrangements for the Implementation of the peace plan to Eritrea and Ethiopia on August 5 and August 6 respectively. At that time, Ethiopia requested that the Technical Arrangements be non-amendable and was written accordingly. Both countries were expected to send formal replies to President Abdulaziz Bouteflika of Algeria, the OAU Chairman. August 7, 1999: Eritrea officially accepts the Technical Arrangements in its entirety, and commits to its full implementation. The document calls for a cease-fire, a withdrawal of troops to positions held prior to May 6, 1998, and the demarcation of the border. August 11, 1999: Ethiopia seeks clarification on the OAU’s “unamendable” Technical Arrangements. August 23, 1999: OAU provides clarifications to Ethiopia. December 6, 1999: Prime Minister Meles Zenawi officially rejected the Technical Arrangements. February 22-March 8, 2000: The United States Special Envoy, Anthony Lake, and Personal Representative of the OAU Chairman, Ahmed Ouayahia, shuttled between Asmara and Addis Ababa to get an agreement on a new document referred to as the “non-paper,” a replacement for the Technical Arrangements document. April 1, 2000: Ethiopia rejected Eritrea’s offer to let the Port of Assab be used for shipments of food aid to avert the looming famine threatening millions of Ethiopians. April 29-May 3, 2000: Eritrea and Ethiopia held proximity talks in Algiers. But the proximity talks failed because Ethiopia refused to sign the two substantive documents of the OAU Peace Plan: The Framework Agreement and the Modalities of Implementation. Ethiopia also rejected a cease-fire agreement, which was the first and key provision of the OAU Peace Plan. May 8-9, 2000: The United Nations Security Council sent seven of its ambassadors to Ethiopia and Eritrea as a “last-ditch attempt” to avert war. But the delegation’s effort bear no fruit because Ethiopia told the delegation that it had invested heavily on the war and wanted a quick return on it. 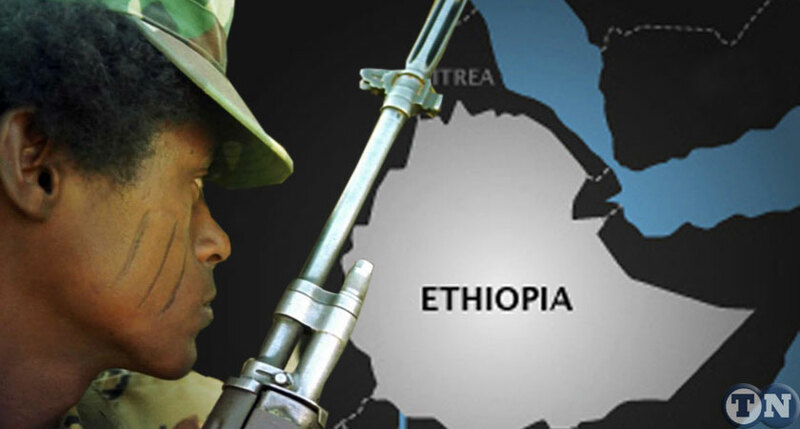 May 12, 2000: Ethiopia launched a massive offensive against Eritrea. May 25, 2000: Eritrea completed withdrawing to pre May 1998 positions. However, President Bouteflika of Algeria informed Eritrea that the Ethiopian government was asking that Eritrea redeploy form additional places referred to as Bada and Burie. Bada and Burie were territories where there was no Ethiopian presence to May 6, 1998. Eritrea nonetheless formally informed the OAU Chairman that it commits itself to re-deploy its troops from Bada and Burie in order to deny Ethiopia any pretext. May 26, 2000: Taking advantage of Eritrea’s withdrawal and rearrangement of its defense forces, Ethiopia proceeded to occupy Senafe and Tserona, areas that were not under dispute. May 28, 2000: Ethiopian aircraft bombed the new power plant at Hirgigo in the Northern Red Sea region of Eritrea causing serious damage to the project. The power plant, which was near completion, was financed under a loan agreement with a consortium of international financiers from Saudi Arabia, Kuwait, Abu Dhabi, Italy, OPEC and BADEA. May 29, 2000: Ethiopia’s fighter planes bombed Asmara International Airport. The bombing sparked a grass fire at the airport and sent clouds of dirt flying over Airport Road. The attack came hours after delegations from Ethiopia and Eritrea flew to Algiers for a new round of talks. May 30, 2000: Ethiopia-Eritrea peace talks opened in Algiers. June 1, 2000: Prime Minister Meles Zenawi of Ethiopia declares the two-year border war has ended. June 2, 2000: A day after it declared the war is over, Ethiopia carried a bombing raid near Assab. June 3, 2000: Deploying two divisions, Ethiopia opened a fresh ground attack to take the Port of Assab. The fighting was underway deep inside Eritrean territory forty kilometers from the port along a line to where Eritrean forces had withdrawn at the request of peace mediators. By the end of the day, Eritrea announced that it had foiled the Ethiopian attack, decimating Ethiopia’s 38th division and killing, wounding or capturing 3,755 Ethiopian troops. June 8, 2000: Ethiopia launched another attack on the Assab Front. The attack involved three divisions or more than 20,000 troops. June 9, 2000: The OAU presented its Proposal on Cessation of Hostilities and asked the two parties to reply within 24 hours. Eritrea accepted the proposal within the 24-hour deadline. June 12, 2000: Eritrea announced that it had foiled the large-scale offensive on the Assab Front. Eritrea also announced that its defense forces had dislodged the Ethiopians from strategic and commanding heights on the Senafe Front after a daylong battle. June 14, 2000: Ethiopia said it accepted the OAU proposal for the cessation of hostilities. June 18, 2000: Eritrea and Ethiopia sign the OAU’s Cessation of Hostilities proposal. The proposal calls for the deployment of UN peacekeeping mission under the auspices of the OAU along a 25 km temporary security zone inside Eritrea and withdrawal of Ethiopian forces to their pre-May 1998 positions. June 30, 2000: The Security Council, by its Resolution 1312 (2000) established the United Nations Mission in Ethiopia and Eritrea (UNMEE) consisting of up to 100 military observers and the necessary civilian support staff in anticipation of a peacekeeping operation subject to future authorization. September 15, 2000: The UN Security Council by Resolution 1320 (2000) authorized the deployment within UNMEE of up to 4,3000 troops. December 12, 2000: A Comprehensive Peace Agreement between Ethiopia and Eritrea was signed. The Peace Plan called on the parties to “permanently terminate military hostilities between them” and to refrain from the threat of use of force against each other. The Agreement, among other things, required the establishment of a neutral Boundary Commission to “delimit and demarcate the colonial treaty border” and a neutral Claims Commission which would decide on claims from either side and calls for an independent investigation into the origins of the conflict.